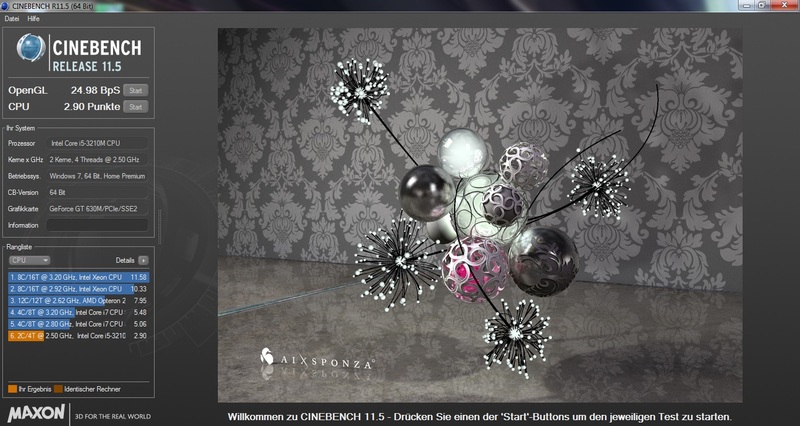 Made for Multimedia. The manufacturer Samsung has been particularly associated with the Galaxy S series of smartphones. 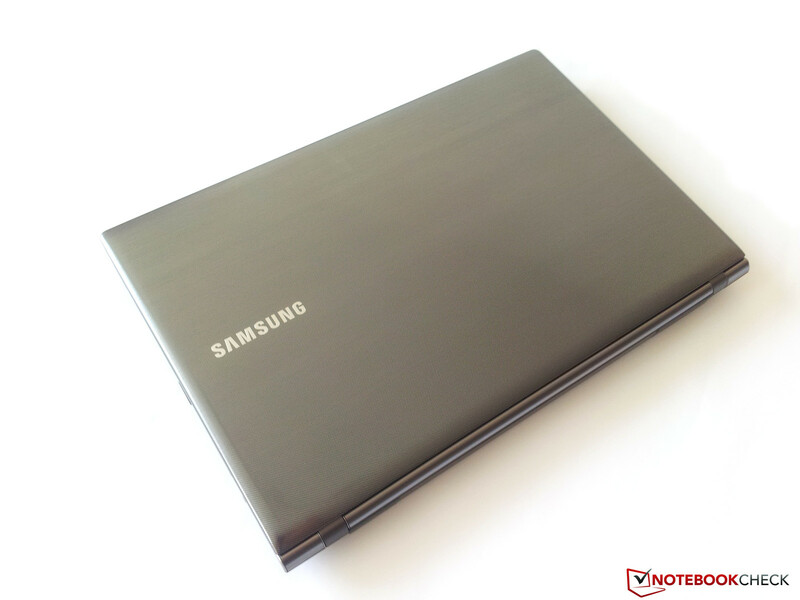 However, Samsung is not an unknown manufacturer in the notebook field, and with the Samsung Series 5 550P5C-T02, it tries to make a case for its inclusion as a significant player in the already mature PC market. Samsung promises a great multimedia experience by using Intel's newest technologies fused with Nvidia's latest graphics and built-in JBL 2.1 sound system. 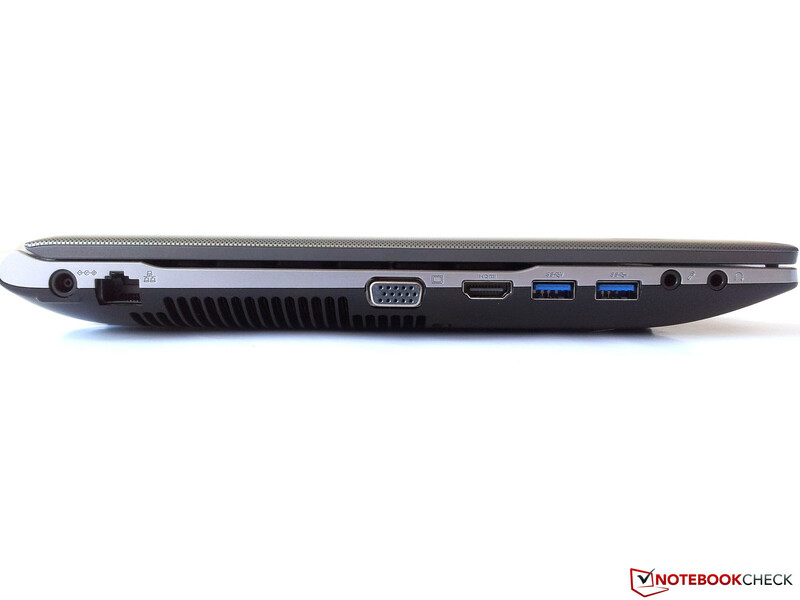 Our test device makes a case for being a multimedia laptop as well as a decent gaming laptop. Computer games run quite smoothly and satisfactorily - naturally depending on the resolution and the game. Samsung's notebook owes this to the interplay of Intel's Ivy Bridge Core i5-3210M CPU, clocked at 2.5GHz, and Nvidia's mainstream GeForce GT 630M GPU, featuring Optimus technology. 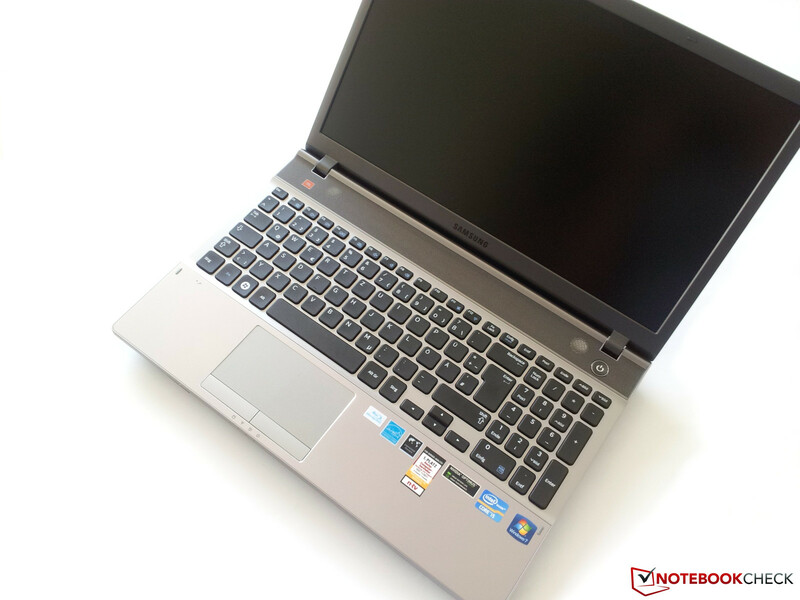 It detects whether the dedicated graphics card's performance is required and, when not necessary, switches to the integrated Intel HD 4000 Graphics that has 16 execution units (EUs), which also has a positive effect on the battery runtime. Also on board is a matte 15.6-inch screen (39.6cm). More in-depth specifications can be found in the following review. 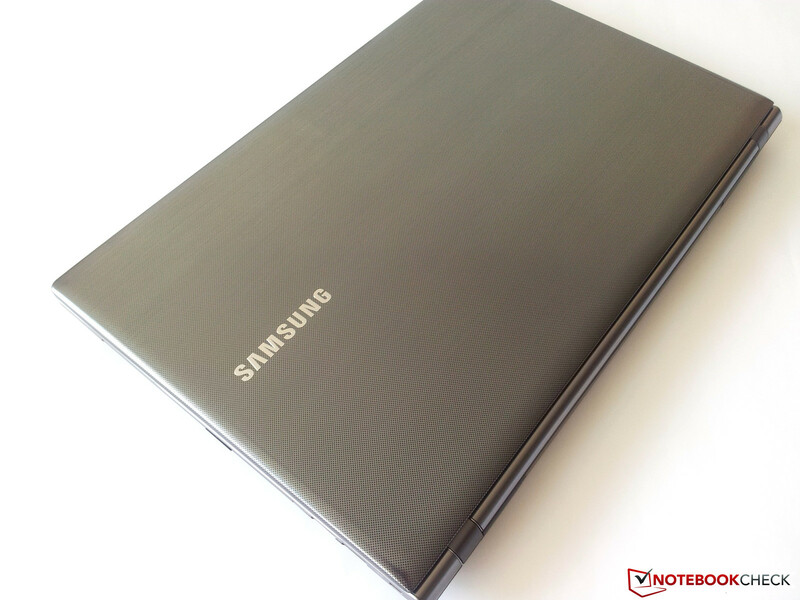 Should you however be interested in the 17-inch form factor, we would recommend the Samsung's Series 5 550P7C-S02 review. 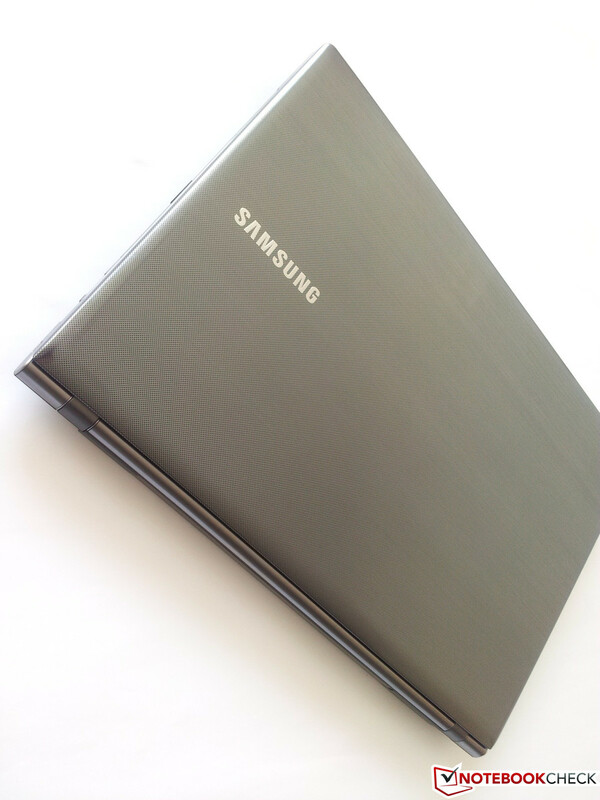 Samsung's Series 5 550P5C's plastic case makes a good impression in terms of looks as well as workmanship. The components exhibit a nice transition without protruding edges or large gaps between the parts. We like the wrist rest's lightly roughened surface, which feels good and is easy to clean. Samsung does not use glossy piano lacquer surfaces on the display lid. Instead it relies on a smooth, dotted, charcoal gray surface for a metal-like look. The company logo is present on the lid. This combination bestows Samsung's 550P5C a restrained, but not boring look. We do not have much reason for complaint when it comes to stability or workmanship either. The area around the case's wrist-rest hardly gives in to selective pressure and the plastic does not generate any unpleasant noises either. 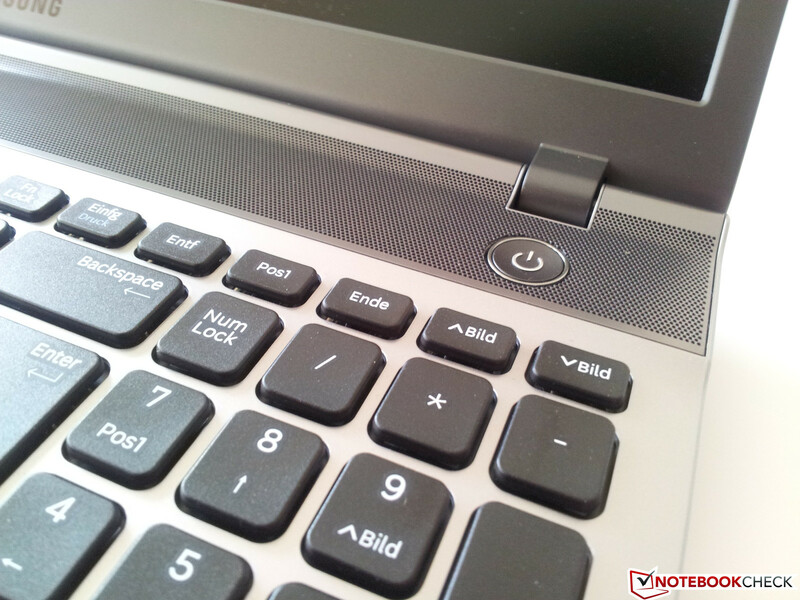 The built-in chiclet keyboard is also very resistant to flex and does not allow the keyboard to be depressed. The case's only flaw is the display lid that deforms under pressure. However, virtually all manufacturers making notebooks of this size and price range have problems here. Therefore, that does not surprise us. Overall, we can give Samsung's Series 5 550P5C-T02 a thumbs-up since the installed hardware is not only offered in a stable and solid case, but also pleasing to look at. Close up of the lid. The laptop at a distance. Fortunately no cutbacks have been made in connectivity. The Samsung's Series 5 550P5C-T02 provides all common ports that are needed for everyday use and does not leave anything to be desired. The interface distribution shows reason for complaint because they are found mainly towards the front on the sides. Particularly, ports that need a thick unwieldy cable are concentrated on the left. Interfering cables are inevitable. The left harbors the power socket and LAN cable interface, the analog video out, HDMI socket and two USB 3.0 ports. However, as if these are not enough, Samsung's notebook designers also placed the audio jacks here. The right looks very tidy if not bare. In addition to the Blu-Ray ROM/DVD burner, you will also find two USB 2.0 ports followed by the Kensington lock. Although the left could be depopulated a bit by moving equipment such as external USB hard disks, USB flash drives or digicams to the right, they would have to be connected to the slower USB 2.0 ports. 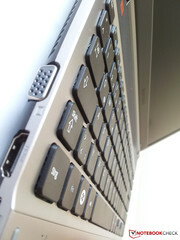 The user can only use the ports on the left side if USB 3.0 is to be used. The 4 in 1 card reader is found on the front (with support for MMC, SDHC, SDXC, SD). 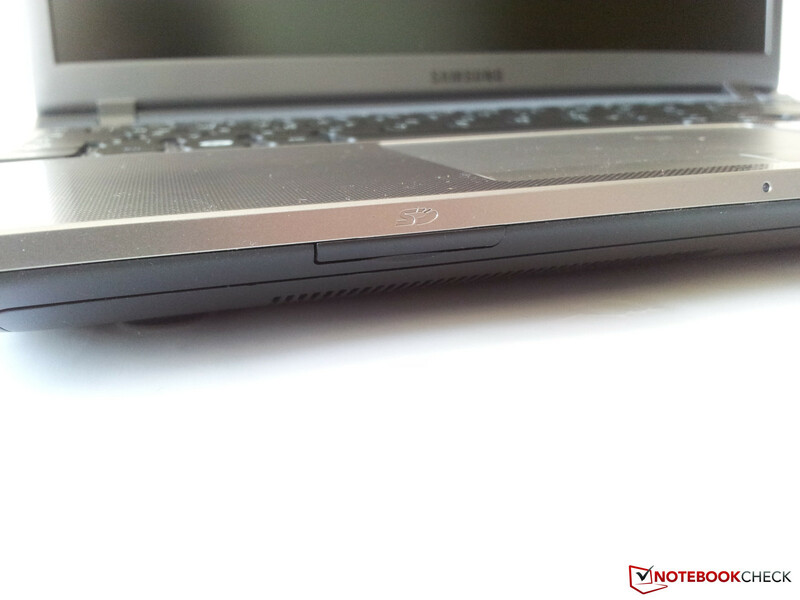 There are no interfaces on the device's rear since the installed battery virtually takes up the entire length. Our test device has several options available for communicating with other computers or the Internet. First there is the old-fashioned LAN port (Realtek PCIe GBE Family Controller, 10/100/1000 MB/s), via Bluetooth 4.0 or a WLAN network connection (Intel Centrino Advanced-N 6235) that supports all common wi-fi standards such as 802.11 a/b/g/n. A 1.3 megapixel web/video camera is installed at the top of the display bezel. The microphone is towards the left of the keyboard. Video conferences via Skype or similar programs are not a problem for Samsung's Series 5 550P5C-T02. A built-in JBL 2.1 sound system is responsible for an above-average sound, but more about that later. Regrettably there are no extra accessories in the box apart from the compulsory power supply. 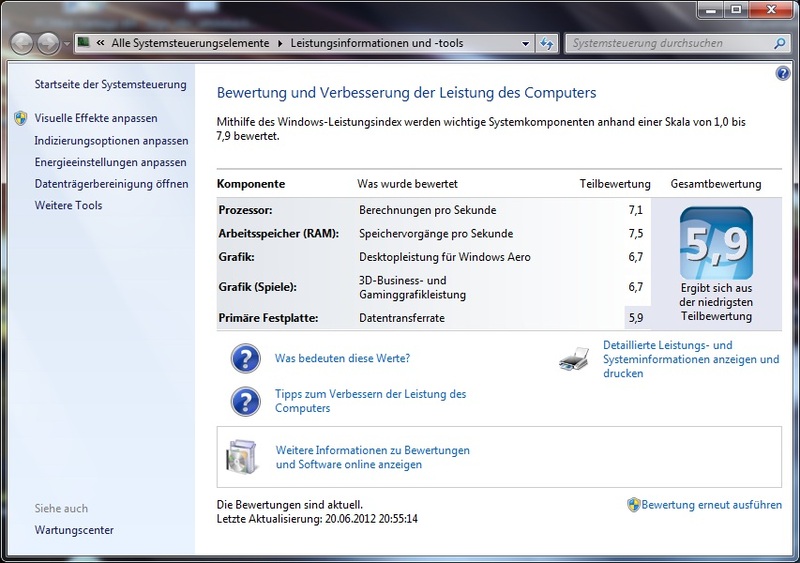 In addition to a few freeware programs, Microsoft's Office Starter and a pre-installed 64bit version of Windows 7 Home Premium is on the hard disk. We also find a trial version of Norton's Internet Security that is especially irritating due to interfering pop-ups and is consequently among the first programs to be deleted. 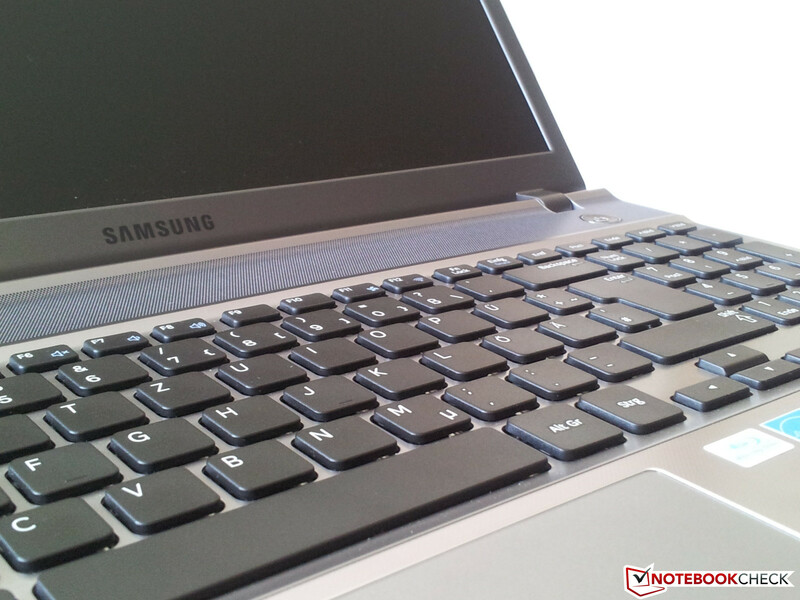 Like all its notebooks, Samsung supplies a warranty period of 24 months with this device. 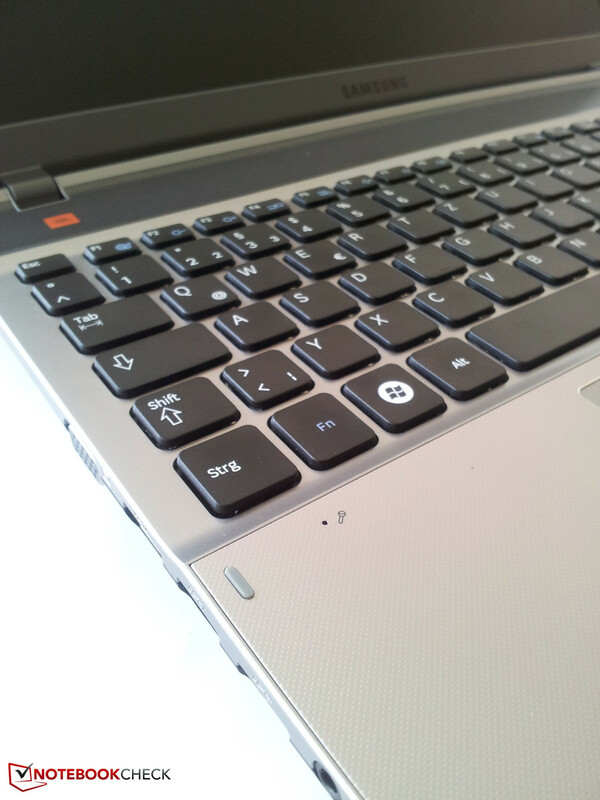 The built-in chiclet-style keyboard does not leave anything to be desired. Like the case, it is locked in tight with very few niggles and fits well with the overall concept. Samsung also sticks to a standard keyboard layout and apart from the top row of keys, does not swap or elongate any keys. This facilitates fast typing and reduces the time need for familiarization with the layout. A full-blown number pad is also great and is not inferior to an external keyboard in anyway. The pressure point is very clear and the key stroke is implemented homogeneously. The keyboard's manufacturing as well as its fit in the chassis makes a very good impression as the keyboard is extremely resistant to flex. Even vigorous typing does not generate any noticeable yielding or a clattery noise. 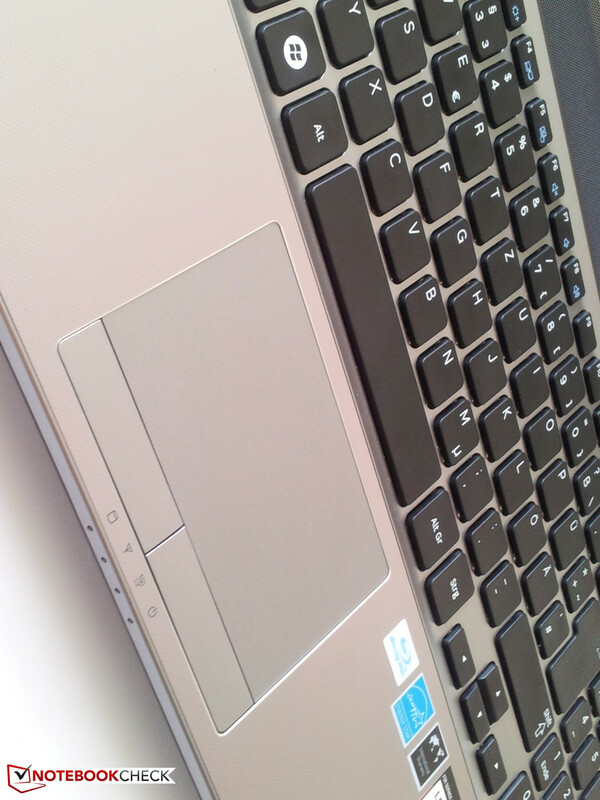 The touchpad and its two mouse keys are slightly recessed in the wrist rest. Dust and dirt soon accumulate particularly at the edges here. 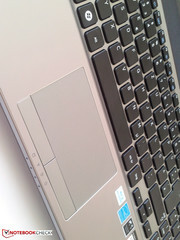 We would describe the mouse pad surface as smooth and pleasant to use. Its functionality is also satisfactory. The mouse cursor's control is easy and precise and we did not notice any jerks or interruptions. Both mouse keys, which emit a quiet click when triggered, work flawlessly. 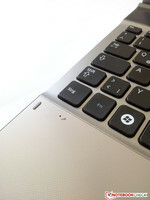 The touchpad also implements multi-touch gestures such as zoom or scroll just as smoothly. 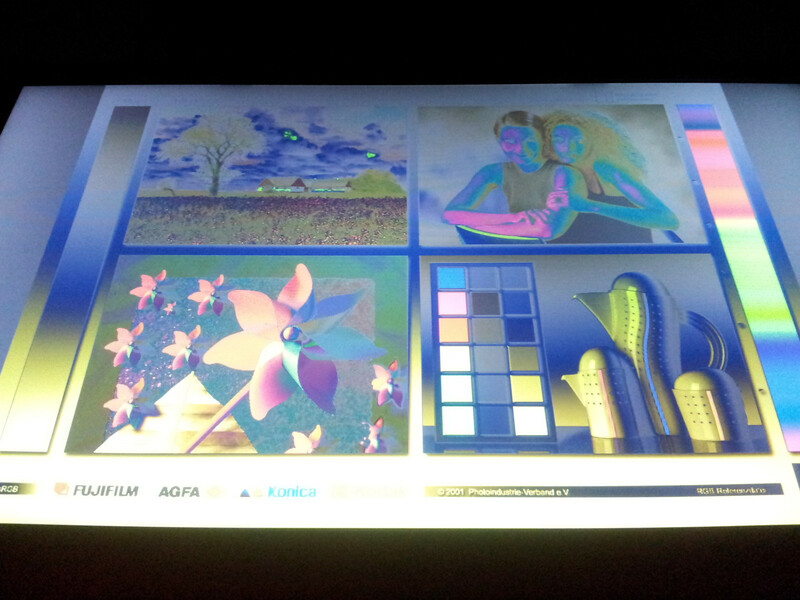 Samsung installs a matte screen in the Series 5 550P5C-T02 model. 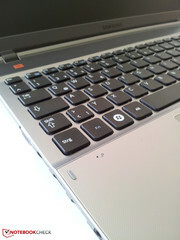 It does have a slight advantage over laptops featuring a glare-type screen surface with respect to visibility outdoors. This is the case, even if only to an extent, when the notebook was not exposed to direct sunlight. The AR coated 15.6-inch HD LED TFT screen features a screen size of 39.6cm and a maximum resolution of 1366 x 768 pixels, which makes our test device HD ready. The measured brightness levels are quite surprising. We could measure a maximum screen brightness of 290 cd/m2 in the top-center quadrant, which is a very good reading in our opinion. But the "darkest" spot of 200 cd/m2 is middling quality at best. Although the measured rates are quite inhomogeneous, it is not noticed in practical use. Unfortunately, the screen's contrast is disappointing. Blacks in dark scenes don’t look saturated, especially at maximum brightness. A grayish haze is always visible and mars the installed screen's otherwise good impression. Of course, the viewing angles vary from screen to screen. Our test device's screen reacts quite sensitively to changes to the vertical viewing angle. 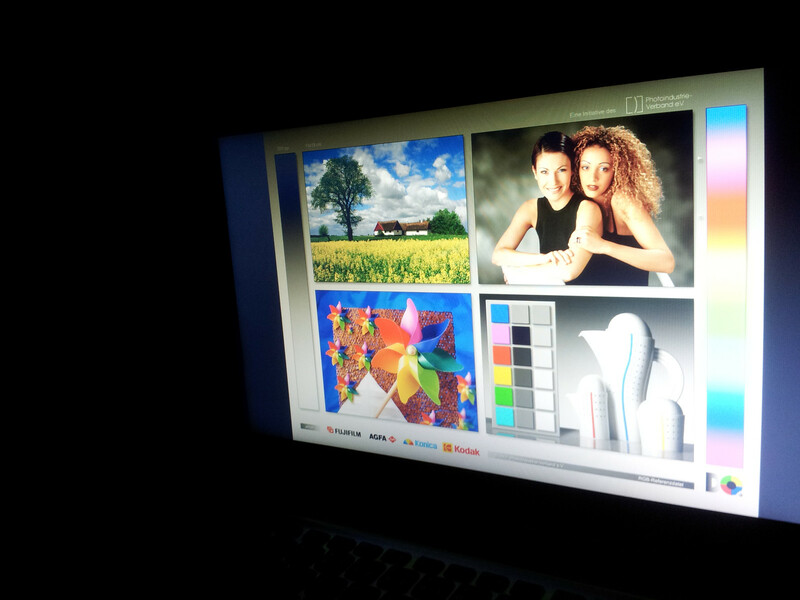 Color deviations turn up quickly. The horizontal viewing angle stability is quite accommodating to changes. Although image deviations are noticed, they first evolve at a fairly flat viewing angle and are more than acceptable in our opinion. In addition to the workmanship and connectivity, the installed hardware is quite important. Many users will first give the installed hardware a once-over before looking at the rest. After all, everyone wants to buy as much performance as possible for their money. One thing first: The installed hardware in Samsung's Series 5 550P5C-T02 might not be the strongest in terms of performance, but our test device was not designed for that. But it is state-of-the-art in any case. 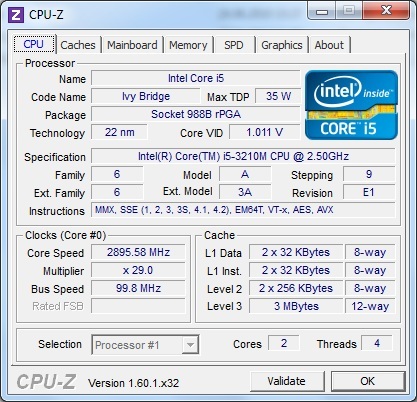 The dual-core i5-3210M CPU is based on Intel's latest Ivy Bridge architecture. In contrast to the Sandy Bridge architecture, which was built on the 32nm process, the manufacturing is now made using the smaller 22nm process with 3D transistors. Intel classifies it as a 35 watt TDP (thermal design power) CPU. Thanks to Hyper Threading, the two cores can process up to four threads at the same time. The Core i5-3210M CPU is clocked at 2.5GHz, but it can be increased to 2.9GHz or even 3.1GHz when only one core is needed via Turbo Boost. 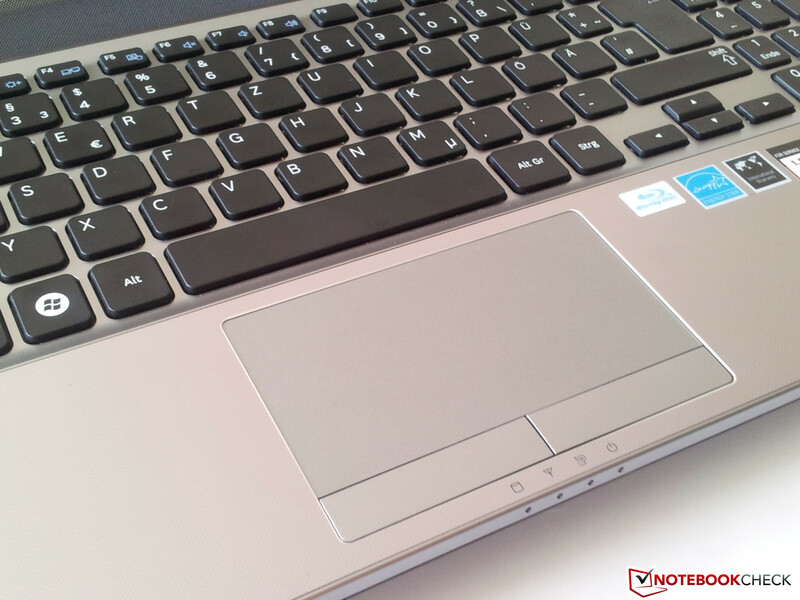 Compared with Dell's Vostro 3560 laptop, which is also equipped with a Core i5-3210M, the CPU assessments are very similar as expected. The integrated Intel HD 4000 graphics features 16 execution units (EUs) which are responsible for the decent performance of the GPU. 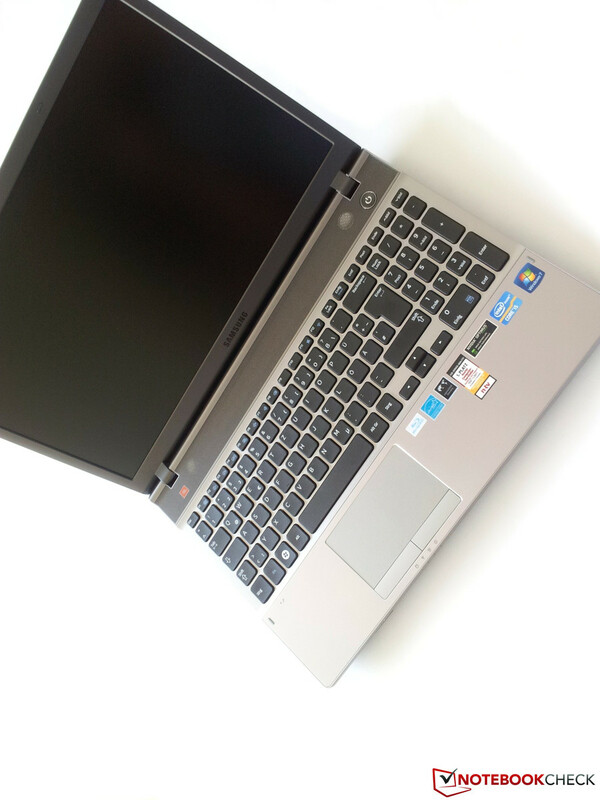 Moreover, our test sample can rely on the stronger GeForce GT 630M (core clock: 475MHz, graphics memory: 900MHz, shader: 950MHz) when an application needs higher GPU performance. Nvidia's GeForce GT 630M has dedicated 2048MB GDDR3 video memory and supports DirectX 11, DirectCompute 11, OpenGL and CUDA. 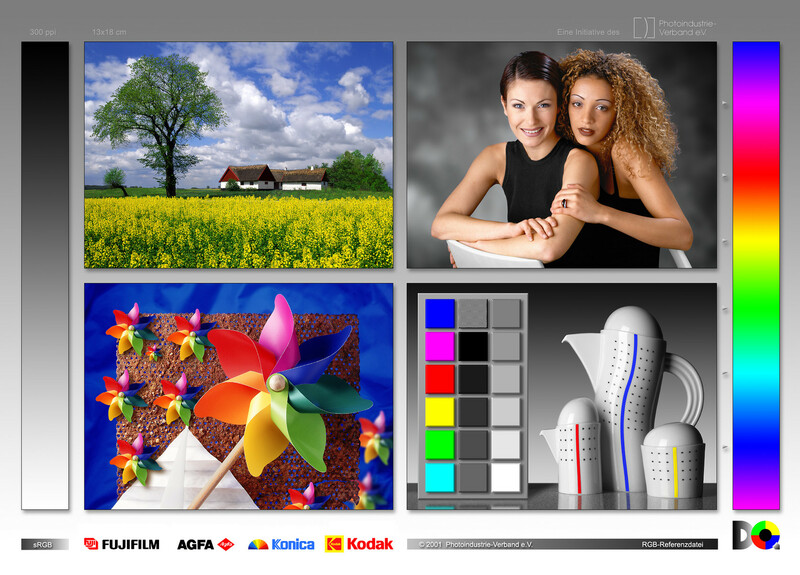 Optimus technology switches between both graphics solutions automatically. Optimus takes over and enables the GeForce GT 630M without changing the graphics settings or making a system reboot necessary when required. 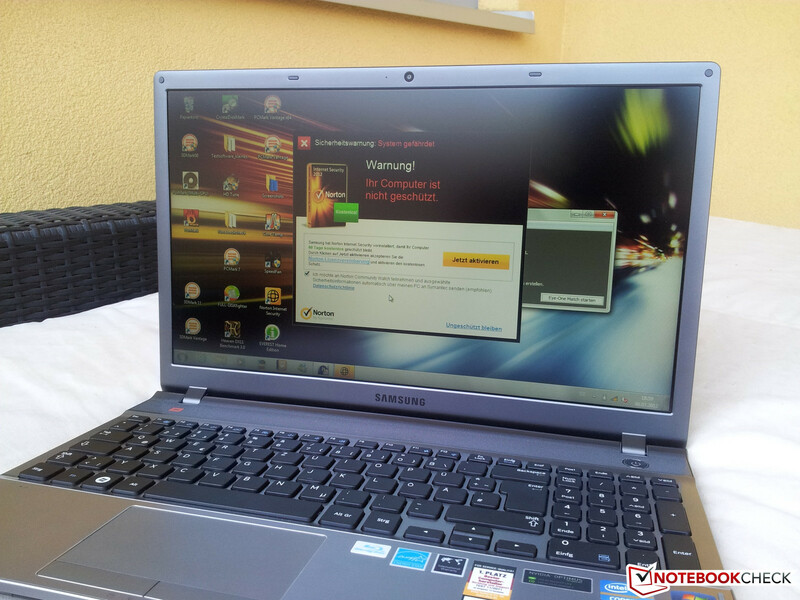 In terms of performance, the GeForce GT 630M is on a par with a GeForce GT 540M from the previous generation. This looks different when compared with a GeForce GT 640M because it is about 20% faster than our GeForce GT 630M and the 640M is based on the newer Kepler architecture based on the 28nm process. 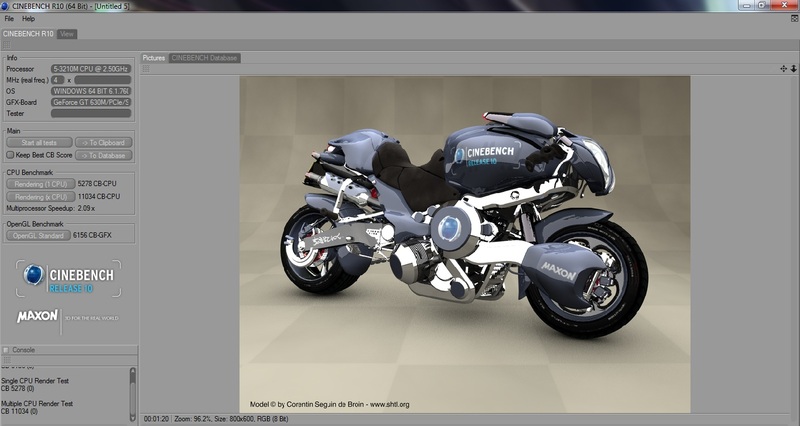 Nevertheless, it has enough power to render games in reduced resolutions and details smoothly. 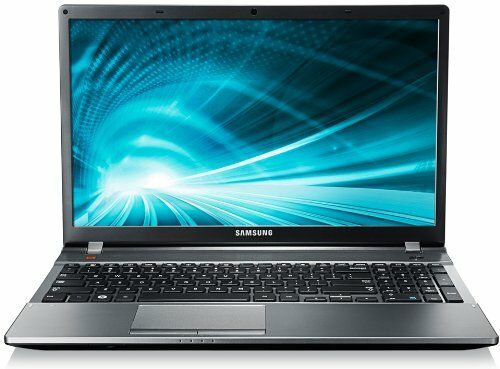 Samsung launches a strong laptop onto the market with its Series 5 550PC5C-T02 due to Intel's Core i5-3210M and Nvidia GeForce GT 630M. The test device is complemented by 8GB of working memory and is well-equipped to handle the multitasking needs of the user. 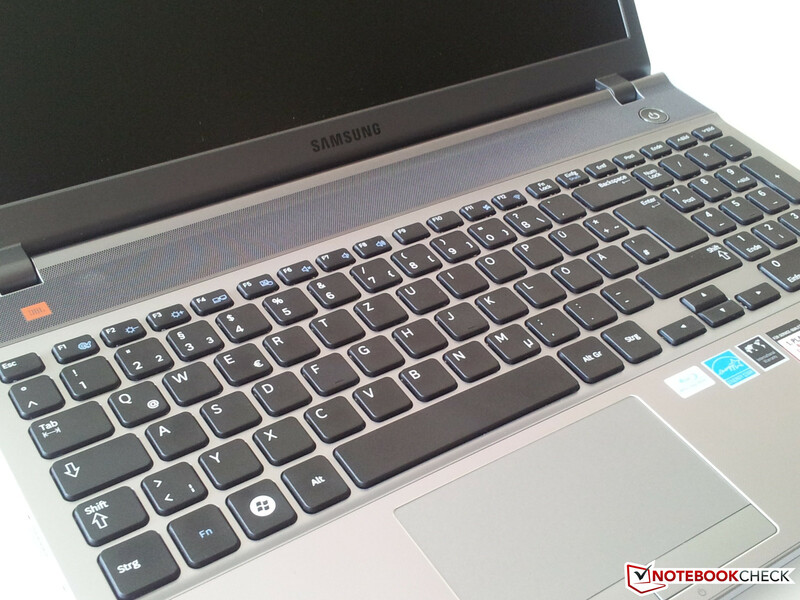 Samsung installs two 4096MB DDR3 memory modules (PC3 - 12800 at 800 MHz) of its own brand into the laptop. 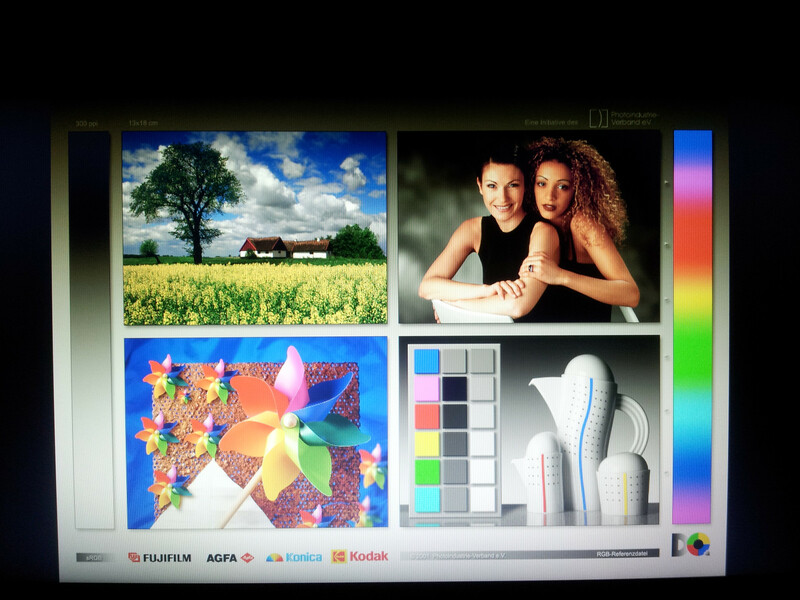 Routine applications or usage as a multimedia center is hardly a challenge for the 550P5C-T02. The only weak point that could be a bottleneck is the installed hard disk. The user gets Seagate's Momentus Spinpoint M8 ST1000LM024 with 8MB cache. 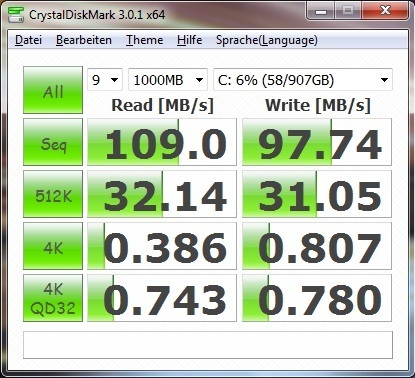 It is a 1TB disk that spins at 5400rpm and is connected via SATA-300. 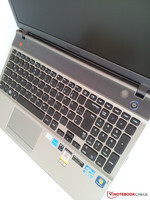 Scores of 2791 points in PCMark 7 and 9691 points in PCMark Vantage cannot be compared with notebooks featuring an SSD. 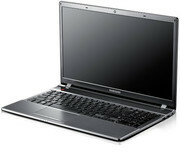 However, they do not give reason for concern since the rates are quite acceptable for a laptop with this equipment. With an access time of 21.0 ms, the Seagate Momentus Spinpoint M8 ST1000LM024 is not the fastest of its kind, but it offers enough storage so that an external hard disk is unnecessary. 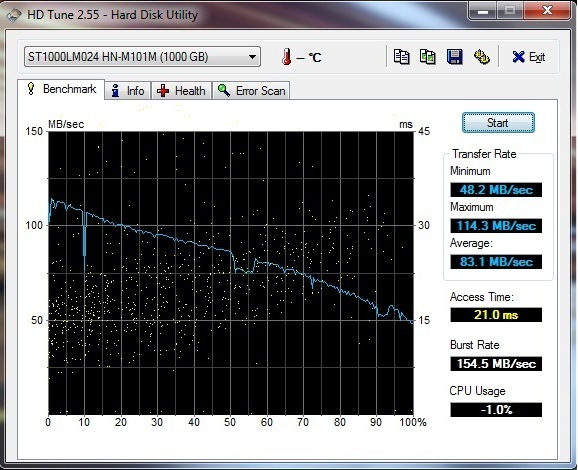 Upgrading to an SSD would be an option and would also increase the system's subjective performance enormously. This can be seen well in our review of Samsung's 830 Series 128 GB SSD or Asus' Zenbook Prime UX31A Ultrabook under "Storage Devices". However, if you need a lot of memory for little money, you will likely be satisfied with Seagate's Momentus Spinpoint M8 ST1000LM024 performance. Having done the 3DMark or PCMark benchmarks, we also wanted to know how suitable Samsung's Series 5 550P5C-T02 is for gaming. We ventured into the world of Diablo 3 with the Core i5-3210M CPU, GeForce GT 630M and 8GB of DDR3 RAM. The monster hunt was quite smooth with a constant frame rate of over the critical 30fps in high details and a resolution of 1366 x 768 pixels. 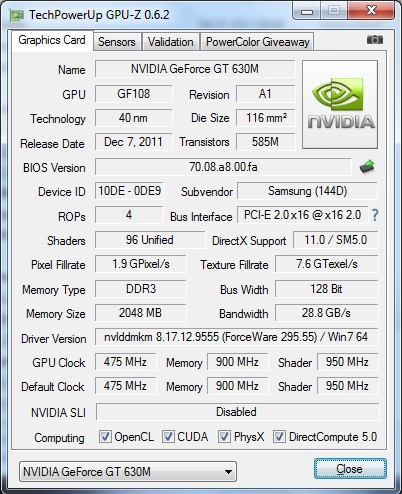 However, our GeForce GT 630M finds its limits at ultra-settings. We then entered the world of Skyrim, where the in-game graphics are a bit more sophisticated. The frame-rate recorded by Fraps turned out accordingly and clearly dropped below 30fps at high details. We achieved an average of 31fps at medium details, which are just sufficient for smooth game play. The same is seen in Anno 2070. The installed hardware does not allow more than a medium detail level in this game either. 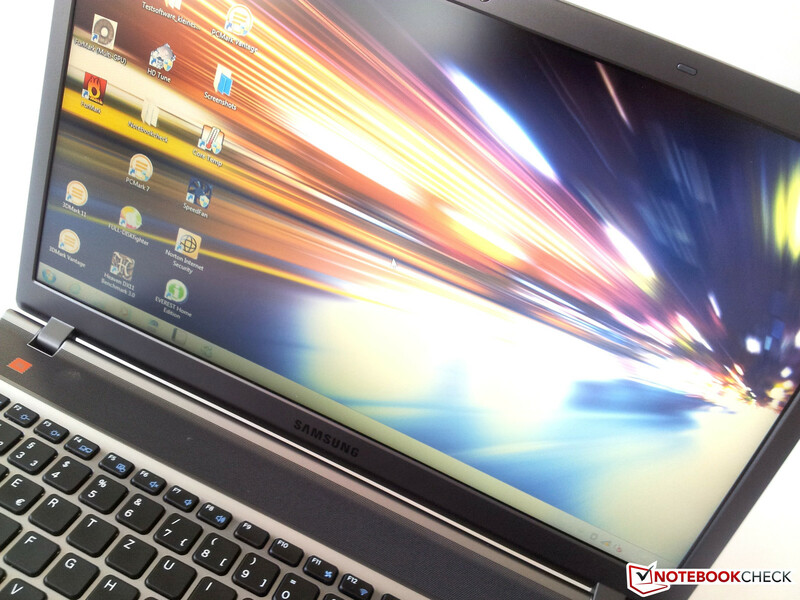 If you want to play with more details and a higher resolution, you should think about a notebook made for gaming like Samsung's Series 7 700G7C gamer. That review should be available very soon on Notebookcheck. It looks much better with older games like World of Warcraft, which run smoothly even at ultra-settings. 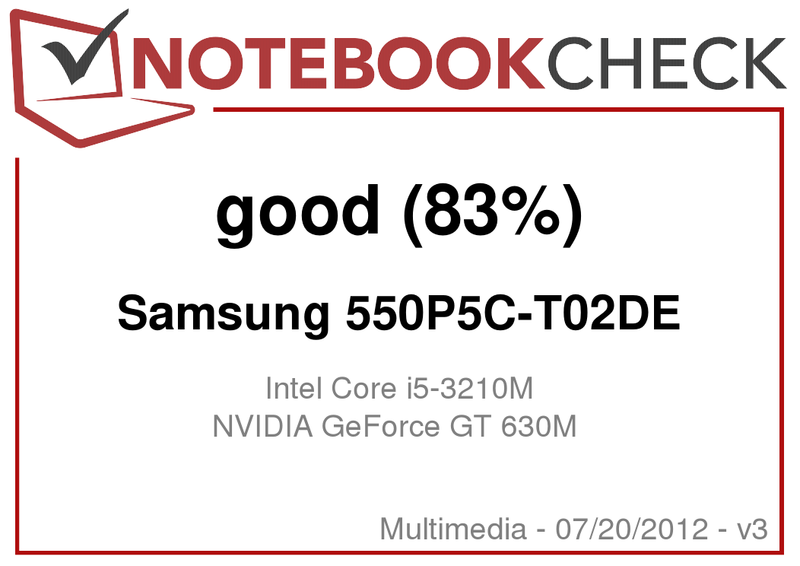 Samsung's Series 5 550P5C-T02 is in the middle of the pack in terms of operating noise. The fan is audible at approximately 31dB (A), but we did not find it disturbing. The Blu-Ray drive is more disturbing while playing a movie with a noise level of 34.2dB (A), this was with the speakers was naturally muted. Our test device does a good job with a reading of 36.9dB (A) during full load conditions. Actually, we could finish this part of our review pretty fast using one word because the description "hothead" would be quite appropriate. 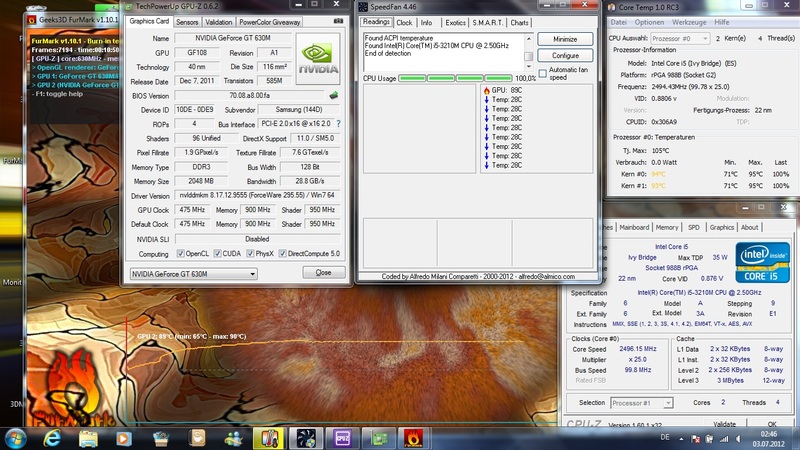 During high load conditions (Furmark and Prime95 running simultaneously for several hours), the core's sensors measure an operating temperature of up to 94-95ºC and approximately 89ºC for the GPU, recorded using CoreTemp and SpeedFan. The waste heat discharged from the laptop's left is accordingly warm. Left-handed users could find it disagreeably warm when an external mouse is used. Considering the operating temperature during load, we were very curious about the behavior concerning the overclocking potential via Turbo Boost and the more unpleasant throttling. 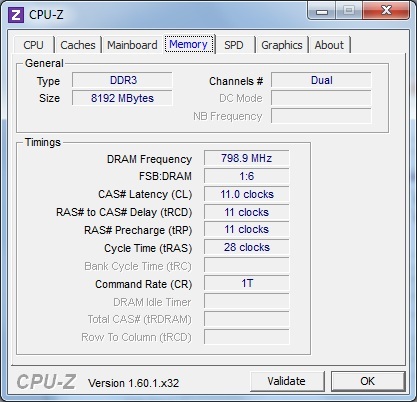 Intel's Core i5-3210M processor overclocks from its default clock of 2.5GHz to 2.9GHz during load. The CPU falls to its default clock at approximately 89ºC due to the temperature. We fortunately could not determine throttling despite the high temperatures, even when the core temperatures climbed to 94-95ºC. However, no matter how hot it gets inside it is hardly noticed on the top when typing. The idle temperatures are alright and within an acceptable range. 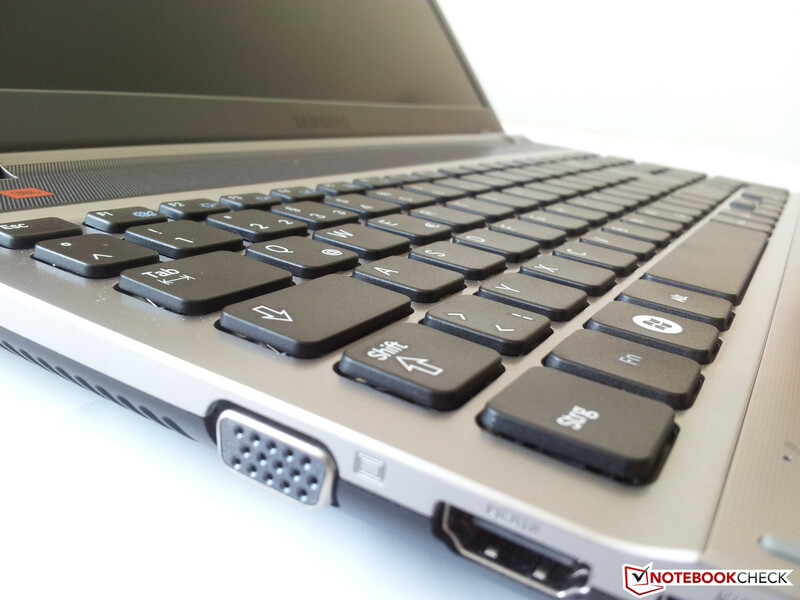 The notebook can be used on the lap without hesitation when not loaded significantly. As mentioned earlier, Samsung's Series 5 550P5C-T02 scores with an above-average sound due to its built-in speakers. Samsung calls on the audio system manufacturer JBL, whose integrated 2.1 sound system is definitely worth listening to and stands out from the vast majority of notebooks in this category. The playback of the tested audio files is clear and tones distinct. The tinny sound typical for this price range, is absent on this model. The bass is also clearly audible thanks to the subwoofer installed on the bottom. The maximum playback volume surprised us as it is more than sufficient and does not override the speakers. However, you should not have false hopes regarding the sound system because you will end up using a stereo system or high-quality headphones if you want to enjoy good sound quality. 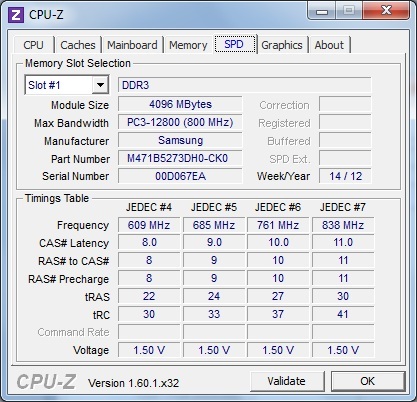 Samsung's Series 5 550P5C does quite a good job with power consumption. 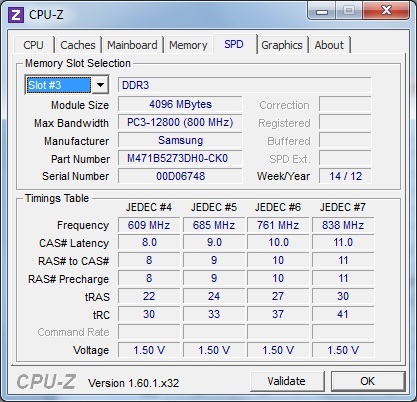 At idle, the power consumed is about 8.3 to 11W. The Acer's Aspire V5-571G featuring an efficient Core i5-3317U ULV processor only showed a slightly lower consumption of about 6.6 - 10.2W in our measurements. 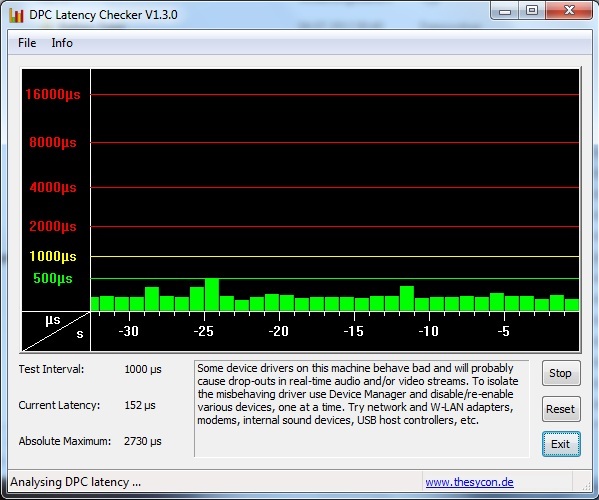 Our test device in standby mode manages 0.5W. However, our test device draws up to 77.4W from the outlet during load. 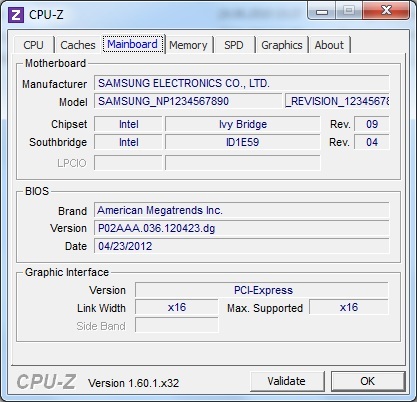 A comparison with Samsung's 17 inch Series 7 700Z3C-S01 (same CPU and GPU), which merely consumes 60.3W, proves that this can be different. 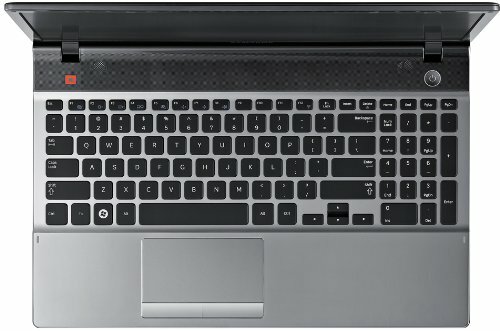 Even the graphically superior Dell Vostro 3560 laptop is more energy-efficient and only needs 59.9W during load. Being a 15.6 inch multimedia laptop, Samsung's Series 5 550P5C is still small enough to ensure a certain degree of mobility. 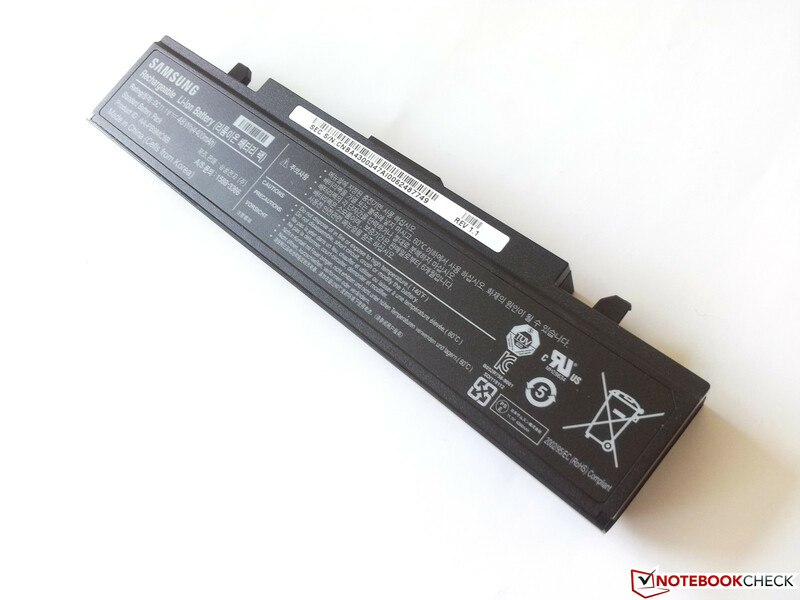 Our test device is equipped with a 48Wh (4400mAh) battery that comes with a promise of up to 6 hours of runtime. Our tests show that 6 hours was not quite achievable. We determined a maximum runtime of 303 minutes (5 hours and 3 minutes) using the BatteryEater test in Reader's mode. Here, wifi and Bluetooth were disabled, the screen's brightness was set to minimum, all external equipment was disconnected and all energy-savings mechanisms were enabled. The battery performance looks better when it comes to playing DVDs where two standard-length movies of 90 minutes could easily be played before the battery ran out. We tested this using “Lord of the Rings - The Two Towers” with a runtime of 2 hours and 55 minutes as well as Fantastic Four 2 with a length of 88 minutes (1 hour 28 minutes). The battery capacity showed up to be 11% after this and, according to the display, would still have lasted for a good twenty more minutes. The laptop ran for 4 hours and 48 minutes before it had to be plugged in when running on wifi. 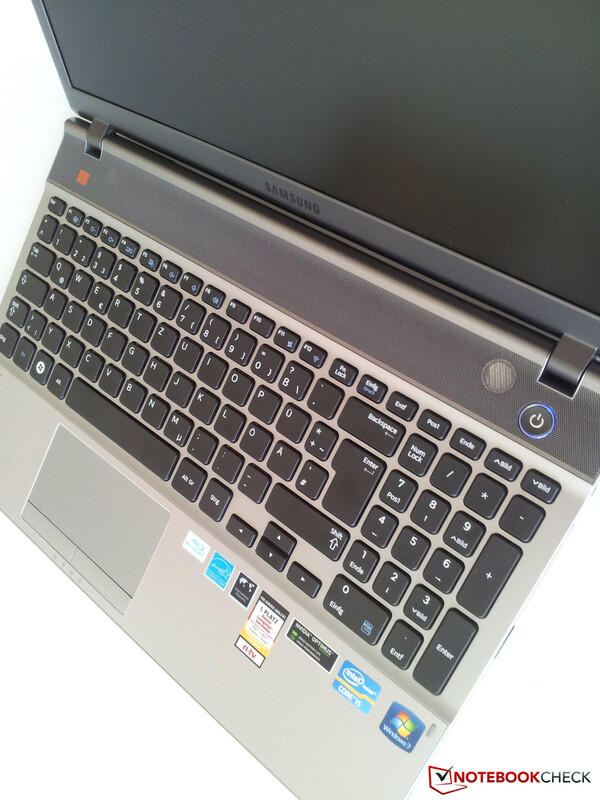 This laptop with middling price and hardware is up-to-date when it comes to hardware at least. The combination of Intel's Core i5-3210M CPU with a default clock of 2.5GHz and Nvidia's GeForce GT 630M (core clock: 475MHz, graphics memory: 900MHz, shaders: 950MHz) provides performance that is absolutely sufficient for routine use. 8GB of working memory, Bluetooth 4.0, 2 x USB 3.0 ports, HDMI and a 1TB hard disk from Seagate are also on board. Office applications, Internet surfing, writing emails and even playing various computer games, with certain restrictions, are possible. Gamers looking for more oomph will however be disappointed by the mainstream GeForce GT 630M graphics card. 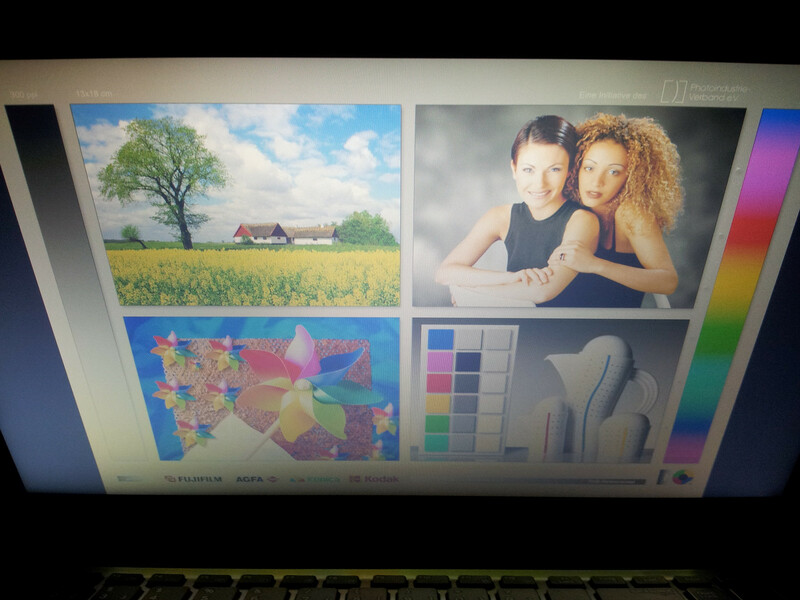 The strengths are revealed in multimedia applications. 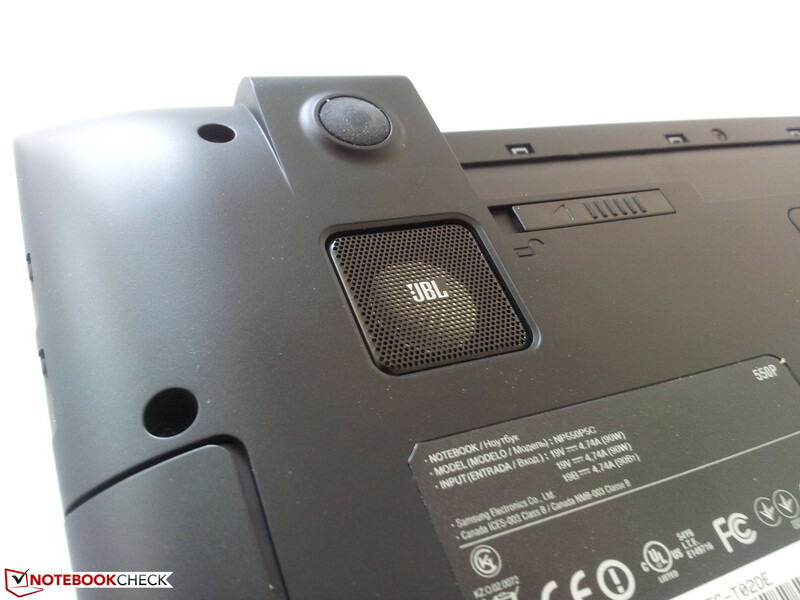 If the laptop is playing a piece of music or even rendering a movie from a DVD or Blu-Ray disc, the built-in 2.1 sound system from JBL will not let the user down. Although we would still recommend the stereo system at home for stationary use, the installed speakers featuring an integrated subwoofer on the bottom are absolutely sufficient for a user on the go and are quite convincing. 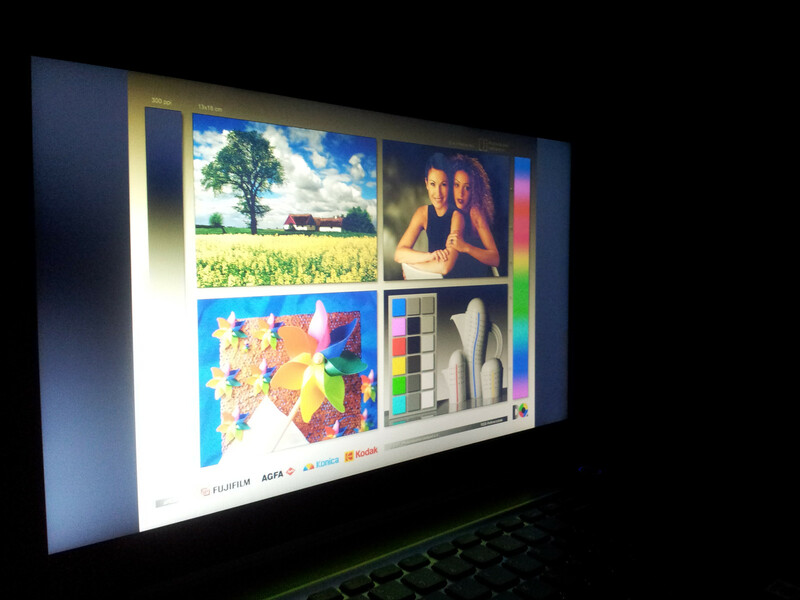 We also find the matte, bright screen agreeable. One flaw of the installed screen is its poor contrast. Another point of complaint is the cooling system because Samsung's Series 5 550P5C-T02 is a hot device in the truest sense of the word. 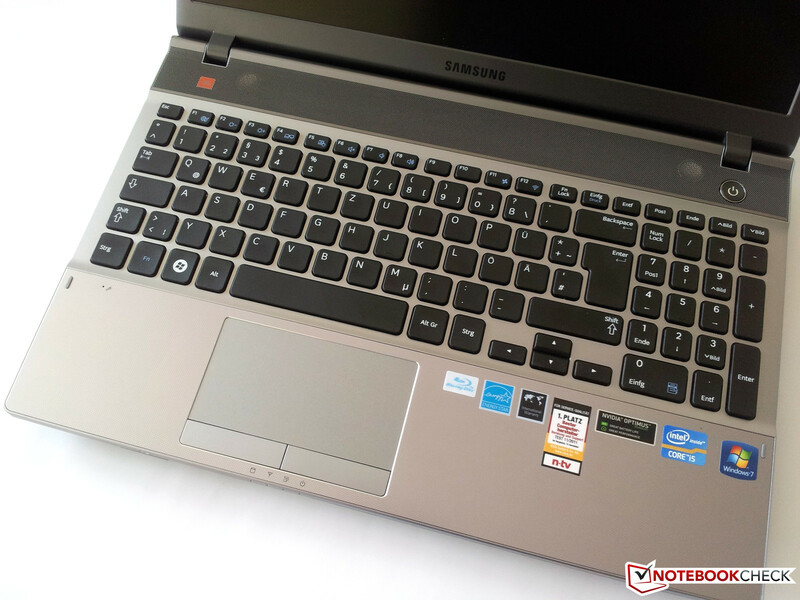 Nevertheless, Samsung's Series 5 550P5C-T02 can be recommended as a multimedia notebook in this price range despite the listed shortcomings. However, if you want a bit more power in a 17-inch case, Samsung's Series 5 550P7C-S02 might also be an interesting alternative. ...and well-crafted keyboard into its Series 5 550P5C-T02. A full-fledged number pad is also on board. 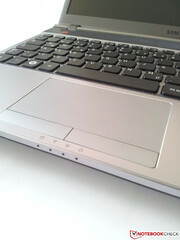 We were also satisfied with the touchpad's functionality. Naturally, the 2.1 sound from JBL has to be mentioned favorably. 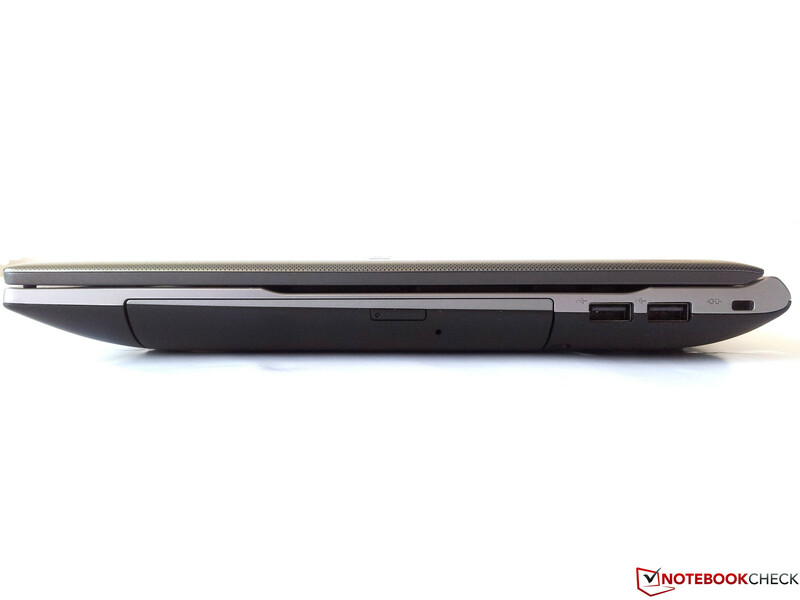 It lets our test device stand out a bit from other notebooks in its class. The performance is sufficient for everyday use. ...a charcoal grey, dotted black surface for metal-like looks. There's not much to complain regarding connectivity. The ports are concentrated on the left. 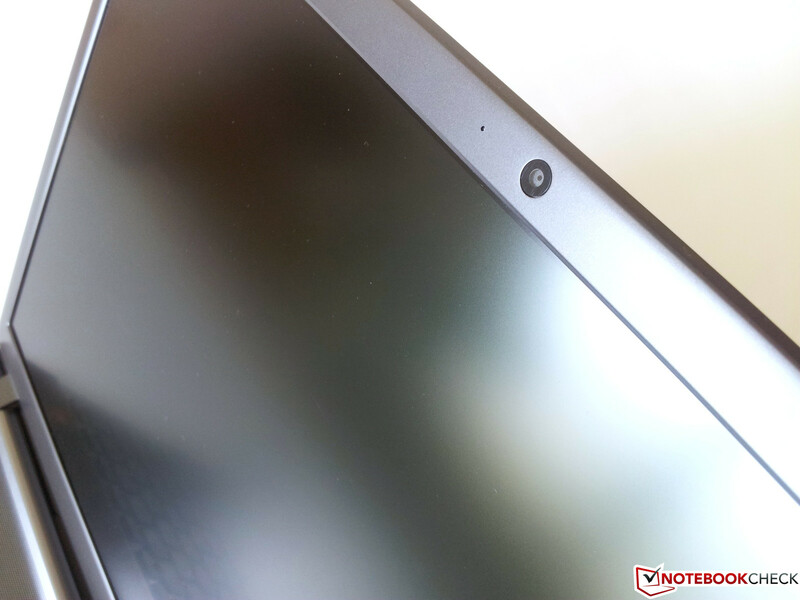 A 1.3 megapixel webcam is built into the display bezel. The fingerprint-resistant surface is a welcome change in contrast to the other polished, glossy notebooks. The operating temperature during load beyond 90 degrees Celsius on both CPU cores and 89 degrees Celsius on the GPU which are definitely too high in our opinion. That will likely be unhealthy for the hardware in the long run. The 2.1 sound system from JBL does a good job job even at maximum volume. In the same price range we find Asus' K55VM-SX064V with the same GPU but with Intel's Core i7 3610QM CPU, and the less expensive Medion Akoya P6633.